In addition to these web site files, there are several brochures that describe Northwest Rail Electric products and services available in our PDF Files area. There are also a number of brocures that cover some of our specific products. Let Northwest Rail Electric help you with all your passenger railcar systems needs. Starting with generating head-end power, distributing power and power management through the HEP lines, to air conditioning systems and controls, our experience spans the entire breadth of electrical systems found on North American passenger trains. Allow us to show you how you can accomplish more with less generating and distribution capacity, saving fuel and capital. We also excel at heating, ventilation and air conditioning systems: HVAC control systems to keep your passengers comfortable from Alaska and Canada in the winter to Arizona and Florida in the summer. In addition to temperature comfort our systems can also operate dehumidification to keep your dome windows clear and provide added comfort for your passengers. 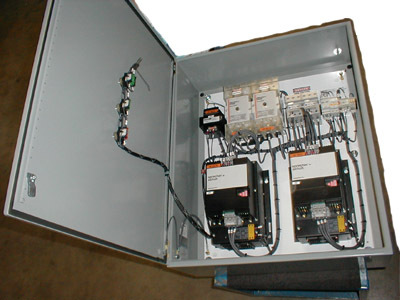 Our generator automation systems allow automatic transfer and control of critical loads when the HEP power system or other power source shuts down. Projects have ranged from a single tourist line coach to installing HEP on a 24 car trainset and complete systems for a 20 unit trainset. Let us help you with all your power, HVAC, and control systems. Pictured at right is one of our custom electrical locker packages for a business car operating on on a major railroad company in the western USA. DC Control Systems, including battery charging and monitoring systems at 12 volts, 24 volts, 32 volts or 64 volts. NW-603-INT Replacement HVAC Control for older Amtrak cars. This system is a near "drop-in" replacement for the "Ogontz Box" systems that were installed on cars 30 to 40 years ago, and today are at the end of their useful lives. This steam locomotive 32 volt DC Control is an example of our custom DC equipment. The drawing at right is of one of our compact BEOH units that provide a very good single-unit replacement for the evaporators, heaters and blowers in older passenger cars. The NW-2 is a 10-ton capacity under-car complete HVAC system. The NW-4 is a rooftop unit designed for use on certain railroad passenger cars. Compact Air Conditioning Evaporator / Blower / Heater Packages for updating the air conditioning systems in heritage passenger cars. Maneurop or Carlyle Compressors may be used by customer request in several of our under-car air conditioning condenser models. These compressors have different features and benefits, and the correct compressor for your application depends on how your car is used. For situations where only the condenser coil and fans need to be modernized, we also offer the The NW-CND-2, which is available in 240 volt or 480 volt 3 phase, or 72 volt DC. Please contact Northwest Rail Electric and talk to either Michael or Bob to determine which system is the best fit for your operation. Various parts for custom rebuilding, including electric boilers for operating existing steam heat systems from HEP electricity, various air conditioning parts including custom coils, fans, and sheet metal enclosures. Entire custom HVAC evaporators and condensers have been made for some customers. HEP-related hardware, including: Amtrak approved wire boots, HEP junction box, wire lugs, wire cleats and various other products. We can supply all of the parts required to equip a passenger car to Amtrak compatible HEP. BICC Brand Rex Wire and Cable for Amtrak approved HEP compatibility. 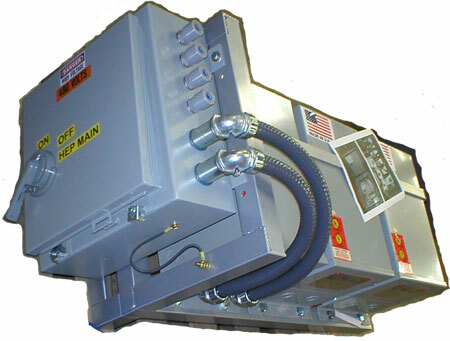 Transformers from Various Manufacturers for converting between HEP voltage and lower voltage equipment. Various custom items and systems have been made over the years. This Tourist Railroad Turntable Power Unit is one example of custom electrical equipment we have made for the railroad industry. 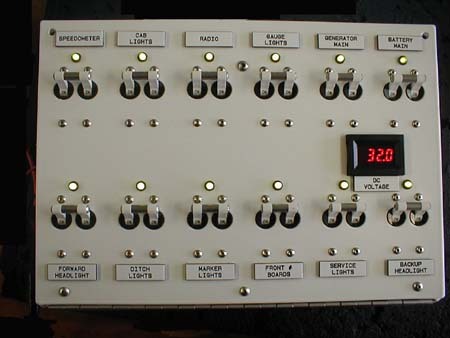 Lighting, including emergency lighting controls and the DC lights themselves.